The EOS Token is one of the most popular tokens out there and with an increase interest and community behind it, surely makes people wonder whether or not the token will rise well above the 10$ mark which it so hard strives to surpass. But will the token surpass this value rather sooner than later, given it’s immense popularity among the ERC-20 tokens? 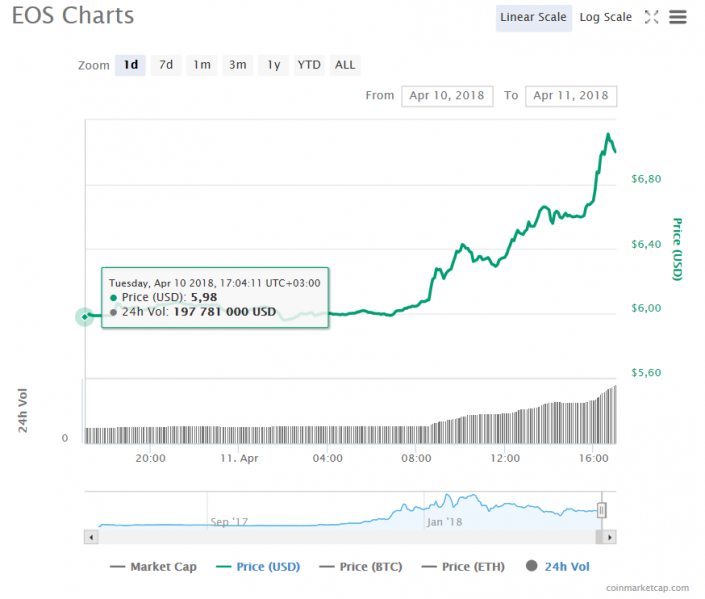 At this point the value of the EOS Token skyrocketed for the past 24 hours with an astounding 17,51% all the way to the $7 mark. This is a lot higher than the usual, given that the token started the day off at a much lower price of $5,98. The rise is likely due to the increased interest of around 723 million USD investment surplus value for the last 24 hours which is getting closer and closer to 1 billion. Of course when we compare that the EOS’s all-time high of $18.71, it is nothing but a small rise in price, but is this a good sign or is it an incoming dump, we are yet to figure out. The EOS token is one of the many ERC-20 tokens, using Ethereum’s solid smart contract enabled blockchain technology. The goal of this token is to become the first blockchain with it’s personal constitution of rules. This makes the EOS token as many refer it “Ethereum on Steroids”, because of it’s abbreviation. The token aims at utilizing the smart contract technology in order to enable millions of funds to be transferred and make it possible to develop completely scalable and decentralized apps system. Such system would likely be responsible for self-management of operations, eliminating any third-party interventions, which if true, can make this cryptocurrency completely autonomous, without the need to regulate by the government, simply because of transparency. The EOS token is also not just another ERC-20 token in the sense that it Is related to tech that aims to ensure that transparency is available, giving the opportunities for it’s tokens to mined legally. And while this happen, they have also thought about scalability, because the price of the token cannot be set quickly as mining operations and activity increases. This means that fluctuations in the EOS tokens price are based on the mining interests and activity of the token which may not fade away as mining difficulty is less likely to increase with more and more miners joining in. The global changes regarding cryptocurrency policy, interest and investors optimism. The crackdown on crypto by the U.S. which followed advertisements and trading bans. The increasing competition and newer generations blockchain technology. But besides this, the EOS token is not the type of token that will fade away soon and even though in Alpha, it has gathered quite the community behind it, which also hints of much more to come. So if you are interested in this token, we advise you to keep track of the latest developments concerning it on social media and community sites. And always keep in mind that cryptocurrencies are a volatile investment asset and their price is very dynamic.